Note: Marcus Stüben has told me (September 2009) that Isert (Paul Erdmann Isert), who often is listed from Fabricius (1793) as collecting in "Guinea" (and was by me also until now) actually collected in "Danish Guinea" = Gold Coast = modern Ghana. See Chapter 2 - Geography and History - Ghana for more. Fabricius's (1793) description is at . Latreille's (1802c) description is at . 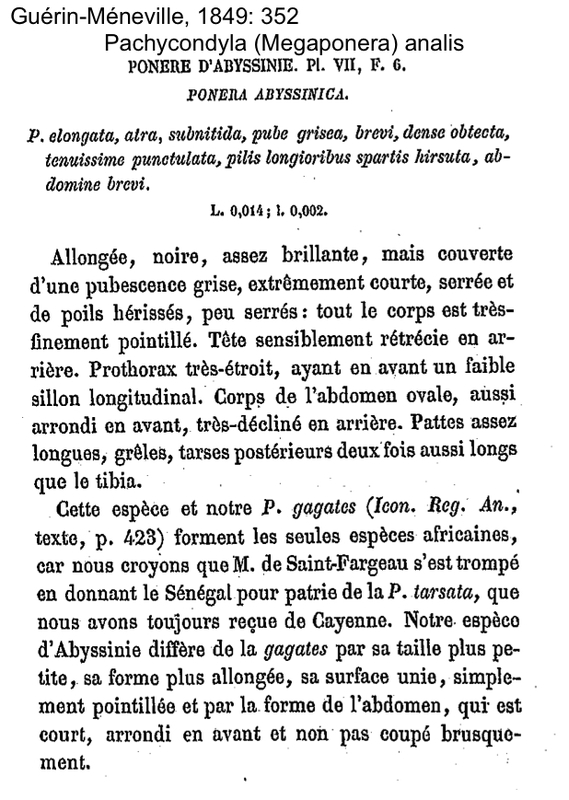 Guérin-Méneville's (1849) description is at . 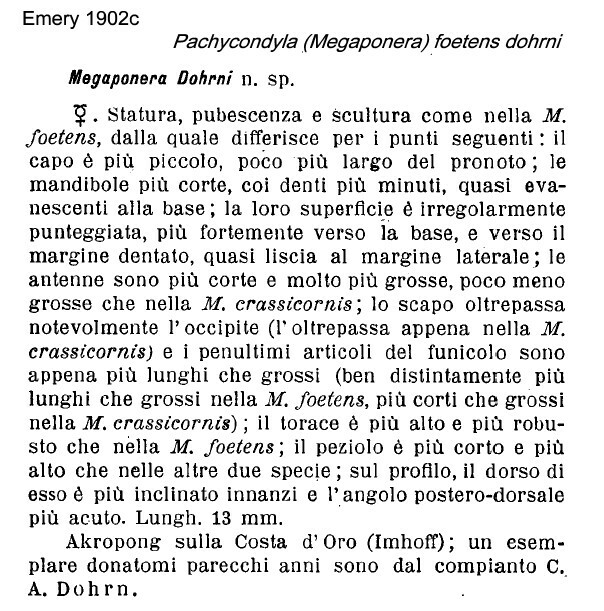 Emery's (1902c) description of dohrni is at . 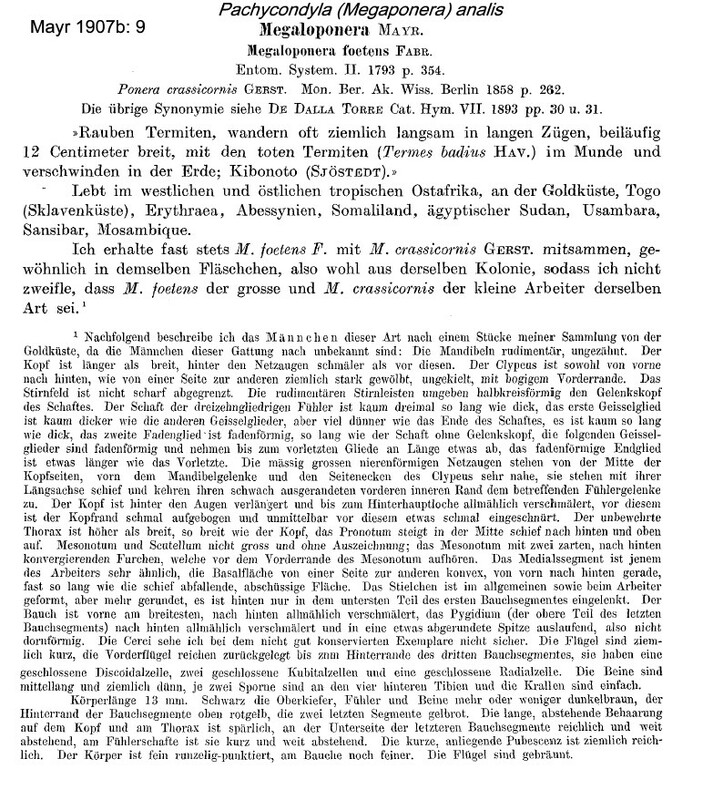 Mayr's (1907b) description of the male is at . Santschi (1935b) described amazon at . 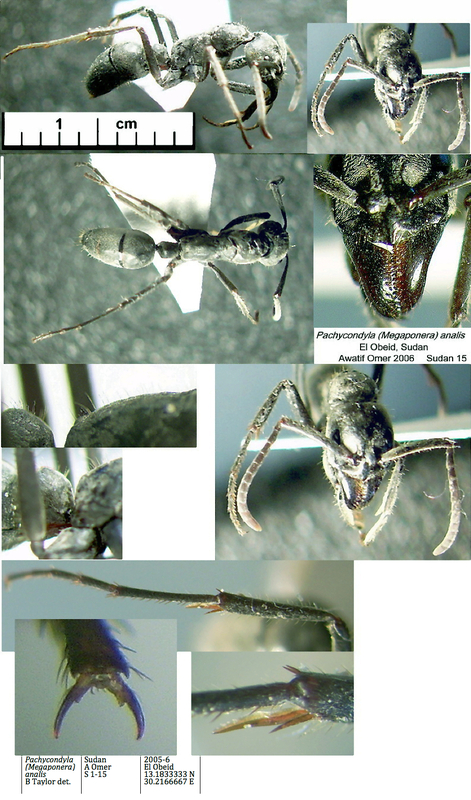 WORKERS - TL major ca 15 mm, minor 9-11 mm; HW 2.40-2.96 mm majors, 1.39-1.99 mm minors (Longhurst & Howse, 1979b; in my guide as Megaponera foetens but only in the index). Although usually described as dimorphic, Longhurst & Howse found it to display monophasic allometry, with some 50% being majors, 25% intermediates and 25% minors, as determined from HW measurement. My first encounter with the species was the specimens from Cameroun and the markedly different appearance of the minor morph led me astray at first. The minor has a very shiny head and pronotum, plus peculiarly reduced forelegs. Both morphs, however, have the genae (cheeks) with a distinct longitudinal carina - previously regarded as diagnostic for the monotypic Genus Megaponera (as in Wheeler, 1922, & Bolton, 1973). 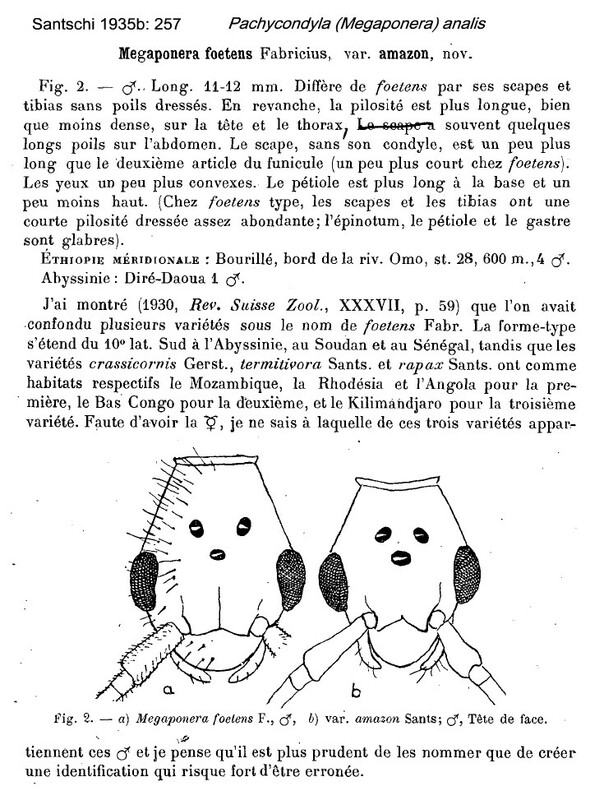 Wheeler (1922) (who provided the nest illustration, right, and linked) listed very many findings from sub-Saharan Africa; from West Africa were Senegal (Thiès, F. Silvestri), Sierra Leone (F. Silvestri), Ghana (Akropong, Imhoff), Togo (at ?, H. Brauns; Bismarckbrug, Conradt), Nigeria (Agege, Ibadan, by Farquharson) and Cameroun (Metit, G. Schwab). Pictured in Hölldobler & Wilson (1990, page 88, as Megaponera foetens). Bolton (1973a) describes it as being confined to savannah areas, being soil nesting and raiding termite nests. An aromatic species, it stridulates audibly when disturbed. In Ghana, Room (1971) found it in the cocoa growing area, on open ground at the Mampong Cemetery farm. In Nigeria, it was studied at Mokwa, in the southern Guinea savannah, by Longhurst & Howse (1979a, b, et ante), who described its predation on termites, and the biology of males. 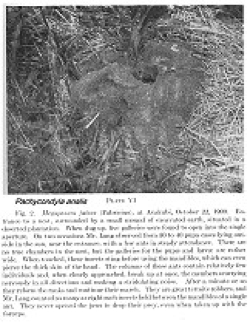 Almost half of the 73 nests which they examined were in deserted nests of the termite Macrotermes bellicosus (Smith), most of the rest were in the ground under bushes. Activity was either early morning (0700-0930 h) or late afternoon (1630-1830h). Major "scout ants" locate foraging termites, by detecting chemicals in the soil sheeting built by the termites. The scout, then recruit other workers, scent trails being used once the route is established. Only the minor workers enter the sheeting and bring out captured termites, stacking the prey around the entry points. At the end of the raid the termites are carried back to the analis nests, mainly by the majors. This behaviour appears to differ from the much more aggressive attacks launched on and into termite mounds by laeviuscula - see below. 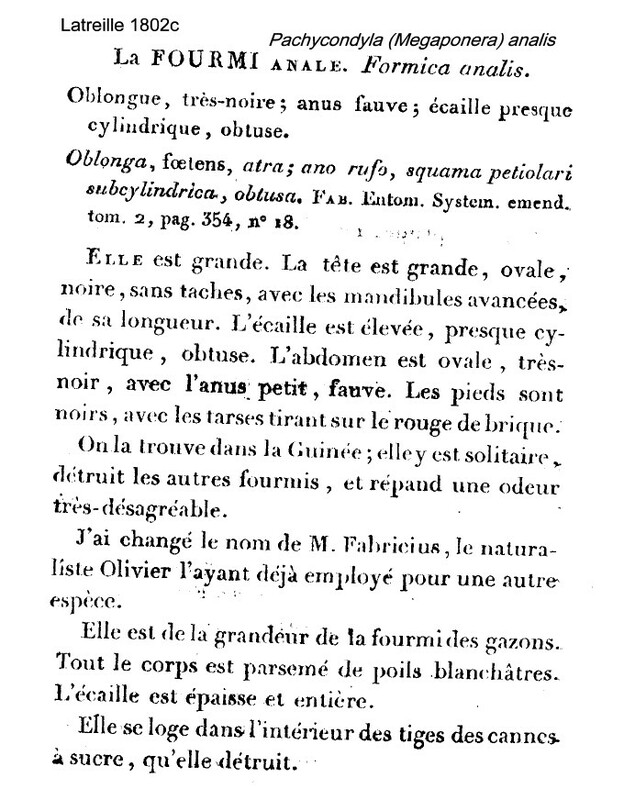 Ivory Coast studies, Lévieux (1976a) gives the colony size as 450-600 adults. Nest density there can be as many as 20 colonies per hectare, but foraging recruitment appeared not to involve a scout ant. The photomontage is of a major collected in Cameroun - 30 km east of Poli (ca °29' N 13°29' E) at a Sudan-Guinea savannah location (McKey Project). The photomontage is of specimens from Sudan, El Obeid, collected by Awatif Omer, 2006, Sudan 15. The photomontage is of a minor from the Central African Republic, Dzanga-Sangha NP; 16.x.2008; 17h30-4h; Camp 1; 03°03'58.3" N 16°08'59.6" E 528 m; A 20 m de l'Ayous (Triplochiton scleroxylon, Sterculiaceae) dans la forêt; collector Philippe Annoyer. .